(CNN) - After failing to gain traction as a Republican presidential candidate and then making an unsuccessful attempt to run as a third party nominee, former Louisiana Gov. 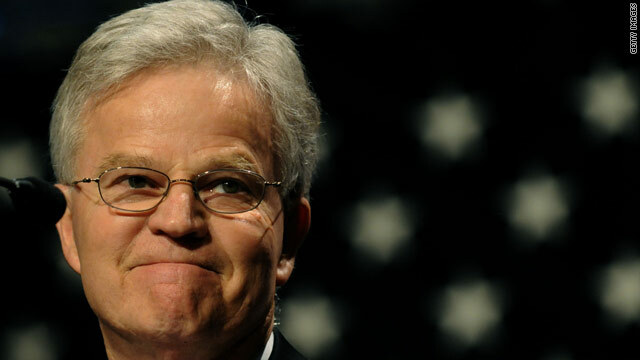 Buddy Roemer on Thursday announced an end to his White House bid. "Today, I am no longer a candidate for President of the United States," Roemer said in a statement. Roemer, who made his campaign official last July, was one of the first to launch a presidential exploratory committee earlier that year. Running on a message of campaign finance reform and what he called unfair trade policies, Roemer staked most of his Republican primary efforts in New Hampshire ahead of its January primary. Facing weak fundraising and a crowded field of high-profile candidates in the race, the former governor garnered only 950 votes in the Granite State contest. Later in the year, Roemer kicked off efforts to capture the nomination for the non-partisan, third party Americans Elect. Founded in April 2010, the party qualified for ballot access in 27 states and raised more than $20 million over two years. Last week, however, the group announced its selection process had ended without a picking a nominee and decided to pass on Roemer, its leading contender. Roemer had low name recognition, the group said, and small fundraising appeal, as he refused to accept contributions higher than $100. In his statement Thursday, Roemer vowed to continue his fight for reform, pointing to partisanship and special interest lobbying as major roadblocks in the political system. "I have said it many times: they are joined at the billfold. The two parties have been graveyards of reform too often in the past. They don't want reform. They only want victory and reelection," he said. Roemer served four terms as a Democratic congressman from Louisiana then became governor of the state in 1988. He made headlines when switching affiliation to the GOP in his third year as governor and lost re-election to a second term. In the private sector, the Harvard graduate worked as the CEO of Business First Bank after leaving office. Jon Huntsman better hope Mitt Romney is not elected. This country will never elect two Mormon presidents in a row. Especially after Mitt spends 8 years messing up the country in the same way GW messed up. And as it stands today, Jon Huntsman is the only Republican man fit to run his party, let alone this country. Mitt just hasn't got what it takes. Probably why he only lasted as Massachusetts governor for 2 years. As with Sarah Palin, Mitt suspended his Governorship for a bigger and better horizon which only HE benefited. I suspect his presidency would amount to the same "me, me, me" idolatry. Huntsman recognized the fact that he could not get the support he needed early enough in the race to withdraw gracefully. An ego-driven candidate like Roemer took a long time to get it through his head that the only thing he could do in this race was be a spoiler. Too bad, Buddy, because you were a rare Republican who spoke truth to power. Truth is NOT what Republicans are about anymore. They can't win on it. So, we are left with their lies, voter suppression, and endless stream of shady donors ashamed to be out in the open greasing the hands of the people who they think will serve their narrow interests, which is profit no matter who it hurts, even if it is the country itself.